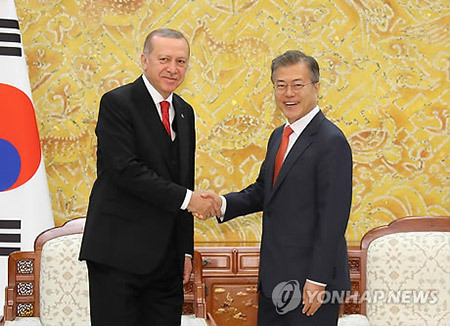 President Moon Jae-in and Turkish President Recep Tayyip Erdogan have vowed continued cooperation in efforts to realize the denuclearization of the Korean Peninsula. 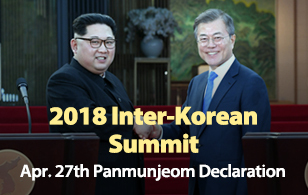 The two leaders made the pledge on Wednesday in a joint statement issued right after their summit in Seoul, assessing that the historic inter-Korean summit created critical momentum for achieving complete denuclearization and establishing peace in the region. The Turkish leader congratulated President Moon for the successful summit and reaffirmed his country's strong support for denuclearization. Moon and Erdogan also agreed to enhance their countries' bilateral cooperation in trade, technology, education and defense, along with other sectors. In addition, the two leaders agreed to boost their cooperation in international organizations, including the United Nations and MIKTA, an informal partnership between Mexico, Indonesia, South Korea, Turkey and Australia.